We all have influence, but how we choose to use it makes all the difference. Dylan, Ethan, and Adrian first attended Elevate, Milestone’s student ministry, this January after being invited by an Elevate leader. Each had a genuine encounter with Jesus and left deeply impacted by what they had experienced. 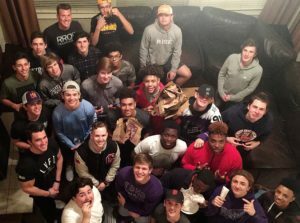 That night they went to dinner and had a conversation that would be the beginning of a powerful movement at Timber Creek. All three were ready to go all-in and impact their school for Jesus. The next Wednesday night the guys brought several of their teammates to Elevate. At the end of service, an entire row of football players came forward to accept Jesus. By early February, a Monday night Bible study had started. 20 young athletes showed up on the first night and the group continues to grow. 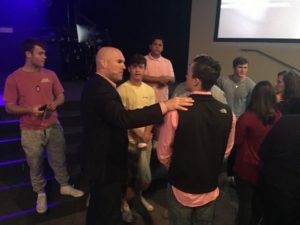 In the last few weeks, more than 25 people have given their lives to Christ from Timber Creek. Last weekend, Dylan, Ethan, and 7 of their friends decided to make a public declaration and get baptized in our weekend services. The positive change they’ve seen at their school is evident and they plan to continue to reach other students for Christ. We are never too young or too old to join God in His mission to seek and save the lost. If you’ve been redeemed by Christ, He doesn’t want you sitting on the sideline. He wants you in the game! Here at Milestone we believe you don’t have to wait to be great. We are so proud of all of our students who go into the mission field daily to affect change in their classrooms, teams, and families and reach others with the love of Jesus. I am so proud of these students. I love their intentional commitment to making TImber Creek better. I am proud that they are expressing their love through our Lord and Savior. Way to go, Timber Creek! You guys are turning things upside down to God! So cool that this is happening and that God wants to do this type of thing at other schools too. Absolutely love this! So proud of each of these guys. It’s been amazing to see this all take place over the last month! Greatness happening among the next generation! Encouraging story when so much of the news about this generation tends to be slanted negatively. Keep going! Seeing these young men Baptized this past weekend left me a mess of tears! So proud to see their passion to reach their team and school for Jesus! I’m so proud of these guys. What a honor to witness their hearts and desire to please God. Following Jesus is not for the weak. We need more strong young men taking a stand in our culture for righteousness. Go get em boys! This is an excitng series of events! What a great foundation to put in place for everyday living! When difficulties arrive, you already know who and where to go for comfort and help. Praise God for your open hearts! I’m so proud of the leadership and direction of these young men. I’m honored to be their coach. Awesome!! Changes like this is what we need to see in today’s public school systems, changes that make a difference in these young men’s lives and the people they reach!